Spacious capacity in a single, compact portable drive for your growing digital library - high-quality, on-the-go storage enhanced by a durable design and exceptional reliability. It’s your life. Keep it all together. 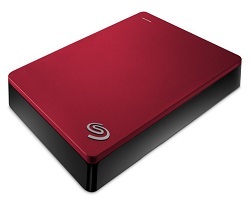 This drive can be easily connected to both Windows and Mac based computers via the USB 3.0 interface eliminating the need for a separate power supply. Once connected, data can be managed using the included Seagate Dashboard software simplifying the process of backing up files, transferring files between external devices such as tablets and smartphones, and more. For added piece of mind, this Backup Plus Portable Hard Drive comes with 200GB of cloud storage using Microsoft OneDrive available for two years and can also be synced with other cloud backup services including Google Drive and Dropbox. Seagate Backup Plus can transform into a Lyve backup device, protecting memories you capture from all your devices. Lyve apps for computers and mobile devices will find all the photos and video from your various devices and create a single, organized collection, which can easily be viewed from your smartphone or tablet - no matter where you are. With Lyve's Moments Past feature, photos and videos taken on this day, week, and month throughout your collection are resurfaced, so you can rediscover your memories from years past.